Back cover blurb: You did nothing. That doesn’t mean you’re innocent. On a night out, four friends witness a stranger in trouble. They decide to do nothing to help. Later, a body washes up on the banks of the Thames – and the group realises that ignoring the woman has left blood on their hands. But why did each of them refuse to step in? Why did none of them want to be noticed that night? Who is really responsible? And is it possible that the victim was not really a stranger at all? #AreYouGuilty of standing by and doing nothing? I guess each and every one of us has been at some point, though perhaps in not quite so dramatic circumstances as the unfortunate characters in this novel. Best friends since University, Cassie, Bo, Anna and Dex are bystanders to a brutal crime. Witnesses to a stranger in trouble. Cassie wants to help, the others don’t want to get involved. Cassie is persuaded to do nothing. It took me a while to get into this novel. None of the characters are particularly likeable and I found it hard to sympathise with any of them, but I suppose that is kind of the point, as we are forced to put ourselves into their shoes and consider what we would do in a similar scenario. The Guilty Party is a complicated novel that is hard to review without giving too much away, so I’m afraid my review is deliberately vague. 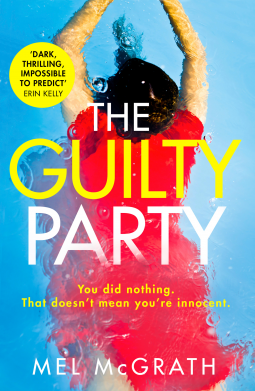 The Guilty Party is available now via Amazon online and all good book shops. Thank You to the publishers who approved my request in exchange for an honest review.